This is the eleventh article of our Living Tabernacles series, where we study the Tabernacle in depth. It is exciting to see how each element symbolizes some characteristic of Yeshua. It is also challenging when we examine what each element means for us, since each of us is now a living tabernacle of YHVH [Yehovah]. We are posting two articles each month as part of this series. YHVH is building His kingdom on earth as it is in heaven. Our King reigns from His throne and also pronounces judgment from there. 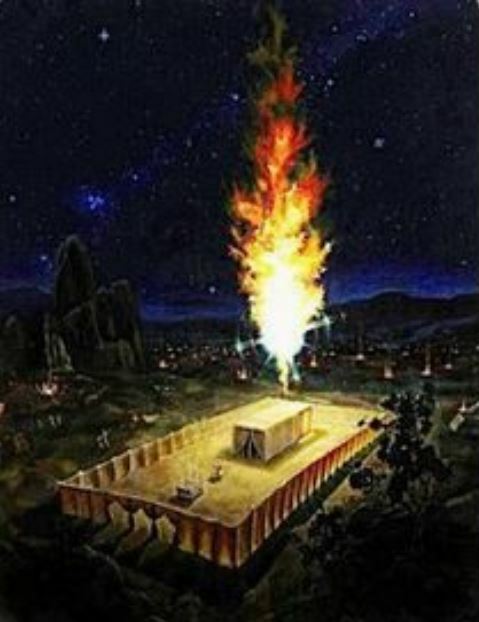 This article focuses on the significance of the Bronze Laver (basin) that YHVH instructed His people to build and place between the Brazen Altar of sacrifice and the Tabernacle. In Exodus 30:18, YHVH [Yehovah] said to Moshe: “You are to make a basin of bronze, with a base of bronze, for washing. Place it between the tent of meeting and the altar, and put water in it” [CJB]. In verses 18-21, YHVH explains to Moshe how this basin is to filled with water and used by the priests for washing before they come into His presence and before they bring sacrifices to the Altar: “Aaron and his sons will wash their hands and feet there when they enter the tent of meeting — they are to wash with water, so that they will not die. Also, when they approach the altar to minister by burning an offering for Yehovah, they are to wash their hands and feet, so that they will not die. This is to be a perpetual law for them through all their generations”. To help the priests see their dirty places more clearly, YHVH also instructed the Israelites to embed mirrors into the bronze laver: “Bezalel made the bronze washbasin and its bronze stand from bronze mirrors donated by the women who served at the entrance of the Tabernacle” (Ex 38:8). Since YHVH wants us to come before Him without spot or blemish (as in Ephesians 5:27), the bronze mirrors from the women helped the priests to clean up those physical spots that would keep them from full immersion into YHVH’s presence. These instructions that YHVH gave to His people show the importance He places on purity. When His people come before Him to minister to Him, they are to be “clean”. So, what does Yehovah mean by clean in this context? He has given us many examples of cleanliness in the physical world, such as His instructions to the priests to wash themselves before coming into the Tabernacle or Temple, for His people to eat clean instead of unclean foods, and to cleanse ourselves after touching a dead body or being healed of leprosy. However, these are only physical object lessons that point to His more crucial message that we need to cleanse and purify our hearts and minds before coming into His presence, as in Psalm 24:4: “The one who has clean hands and a pure heart, who has not lifted up their soul to falsehood and has not sworn deceitfully”. The importance to YHVH of purity of hearts and hands is also shown in Matthew 5:8: “Blessed are the pure in heart, for they shall see God” and James 4:8: “Cleanse your hands, you sinners, and purify your hearts, you double-minded”. After David committed his most flagrant sins, he cried out to God in Psalm 51:10: “Create in me a clean heart, oh God, and renew a right spirit within me”. In James 1:25 [NLT] it says: “But if you look carefully into the perfect law [Torah] that sets you free, and if you do what it says and don’t forget what you heard, then God will bless you for doing it”. So, YHVH says that we are to study the Torah (the Word of YHVH) and follow what it says. The living Word is Yeshua. As it says in John 1, verses 1 and 14: “In the beginning was the Word, and the Word was with God, and the Word was God…. And the Word became flesh and dwelled among us…”. The Word of God (both written and Living) is our water of cleansing – it is His will for us to spend time every day soaking in His Word, being transformed by the renewing of our minds, and being cleansed in our souls so that we can constantly draw closer and closer to Abba and His precious Son, Yeshua.